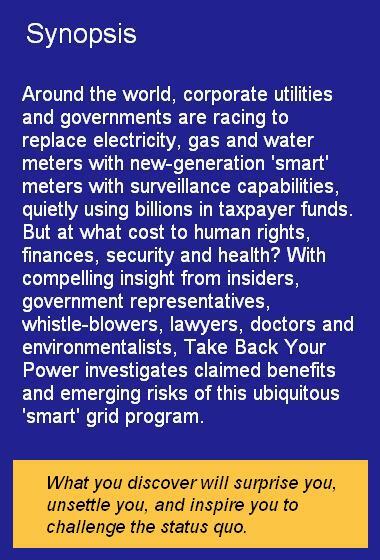 This film dramatizes in clear and convincing detail the way in which “smart” electric meters assault our privacy, our health and our pocketbooks. Free admission. Open to public. Light refreshments. Film showing – 1 hour and 40 minutes. After the break we will divide into smaller groups for discussion of film. David Sheldon, founder of Michigan Stop Smart Meters, and Linda Kurtz, founder of Smart Meter Education Network, will present information on what we need to do to protect our own homes and to move Michigan’s legislature to action. State Rep Tom McMillin has introduced proposed legislation, HR 4513, to protect the rights of utility customers.